The last caption contest was definitely not action-packed (not that they have to be). This week’s photo has both calmness and fire at the same time. How that all fits into the story is up to you. 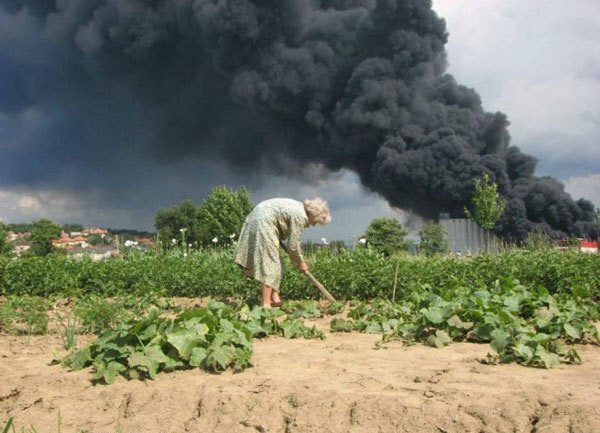 It involves a woman tending her garden while a big fire with dark clouds of smoke rages nearby. Let’s see what you can come up with to explain this scenario. Did the woman have anything to do with the fire? If not, who did? What’s burning? Might this possibly tie in with a previous caption contest? Is there a way to connect it to current events? Use your imagination. Have fun with it. I figure you can’t have too many caption contests that have fire in them, can you? Either way, this week’s episode does. It you want actual context, this is a fire on Mount McLean in Canada. But of course, you are welcome (and encouraged) to make up your own story / backstory for this. 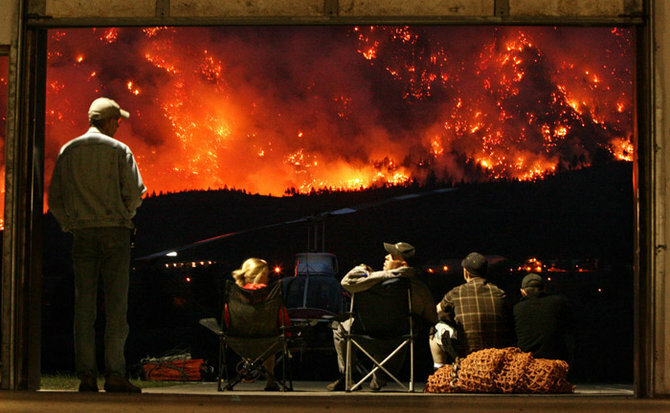 There’s lots of potential here, with a group of people sitting on their back porch watching a raging wildfire. What are they talking about? What will they do? Who is responsible for this catastrophe? Since the last post talked about wanting a flamethrower, it seems appropriate that this week’s caption contest should involve FIRE! 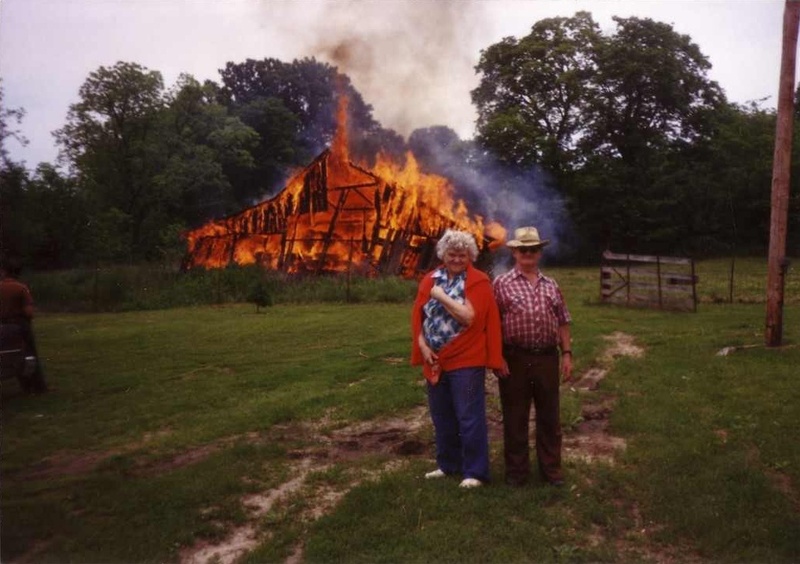 So here’s a picture of a couple posing for a picture in front of a burning barn. Why? I have no idea. That’s up to you. Figure out what’s going on, or what will happen, or what people are thinking, and leave a comment about it. Have fun with it. As I was watching SportsCenter earlier, there was talk of the upcoming golf tournament The Masters, so I thought maybe a golf picture would be good for this week’s caption contest. But I don’t have one that would be open to many captions, plus we’ve done that before. 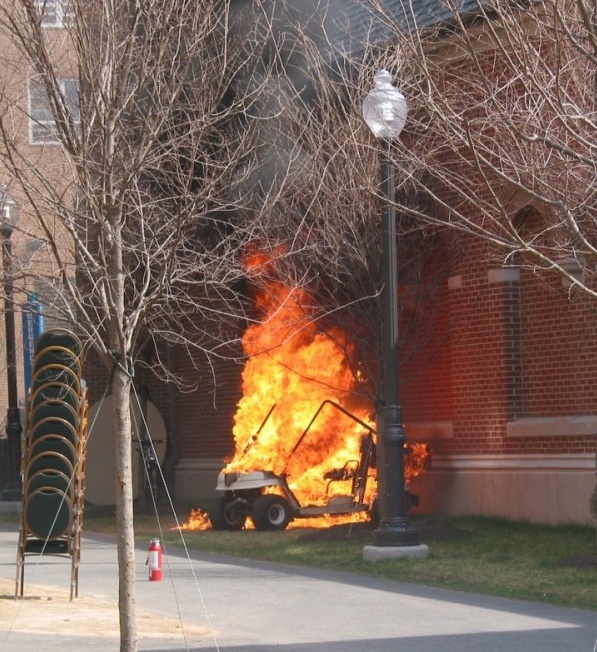 So how about a photo of a golf cart… ON FIRE! This picture really needs an explanation. There is a stack of chairs, a fire extinguisher, and a golf cart on fire, yet no one is around. Something unusual happened here, but I don’t know what. So figure out what could’ve happened… in a funny way, of course.